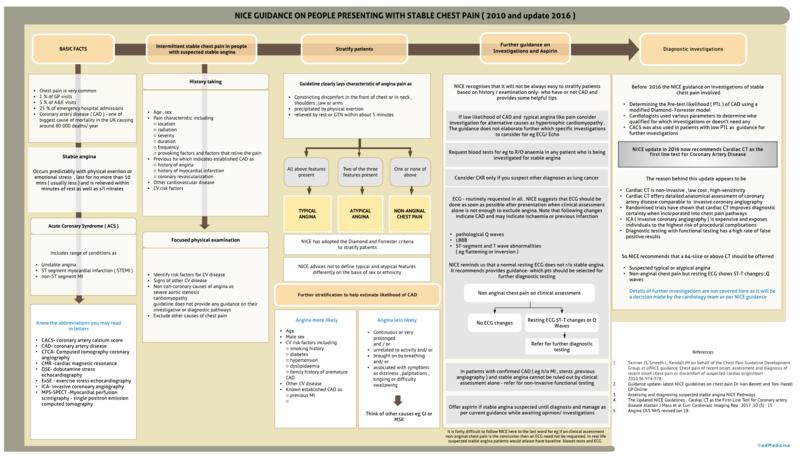 NICE recognises that it will not be always easy to stratify patients based on history / examination only- who have or not CAD and provides some helpful tips.If low likelihood of CAD and typical angina like pain consider investigation for alternative causes as hypertrophic cardiomyopathy . The guidance does not elaborate further which specific investigations to consider for eg ECG/ Echo.Request blood tests for eg to R/O anaemia in any patient who is being investigated for stable angina.ECG – routinely requested in all . NICE suggests that ECG should be done as soon as possible after presentation when clinical assessment alone is not enough to exclude angina. Note that following changes indicate CAD and may indicate ischaemia or previous infarction.NICE reminds us that a normal resting ECG does not r/o stable angina.